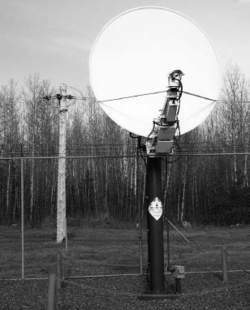 Located in the Chequamegon National Forest in Wisconsin, this satellite receiver was part of the ELF project. According to the U.S. Navy, this and other receivers were shut down in 2004. Conspiracy theorists have their doubts. Conspiracy researchers are convinced that ELF has been used for mind control and has been responsible for many alleged suicides and mysterious deaths. Extremely low frequency (ELF) is the band of radio frequencies from 3 to 300 Hz. The U.S. Navy has used ELF very successfully in communicating with their submerged submarines. Submarines are blocked from most electromagnetic signals because of the electrical conductivity of salt water. However, communications in the ELF range are able to penetrate much more deeply. ELF is quite limited in its use in ordinary communications for the very reason that it is useful to signal submarines. Its extremely low transmission rate would require enormously large antennae in order to communicate over long distances or internationally. The government constructed and maintained two sites, in the Chequamegon National Forest, Wisconsin, and the Escanaba State Forest, Michigan, each utilizing power lines as antennas stretching from fourteen to twenty-eight miles in length. Ecologists became concerned about environmental conditions and human health problems resulting from the great amounts of electricity generated and emitted by ELF, and in 1984 a federal judge ordered construction halted until further studies could be made and evaluated. In spite of the U.S. Navy’s protesting that they had invested over $25 million in studying the effects of ELF and had found their frequencies no more harmful to the environment and humans than standard power lines, the antennae were ordered dismantled beginning in 2004. Conspiracy theorists don’t buy into the abandonment of any government ELF program. They warn that the human brain can be controlled, even at a distance, by the utilization of ELF carried by pulse-modulated microbeams. Shadow government or New World Order agencies have the technology to broadcast mind-control commands directly into the brain by use of microwave beams. Secret Russian neuromedical research discovered that there are specific brain frequencies for each mood, thought, and emotion that humans experience. An extensive catalog of these brain actions with their distinctive frequencies was established by Russian scientists and psychologists. An agent can beam ELF waves for anger, suicide, hysteria, lust, paranoia, or whatever he chooses at a potential victim and control that individual’s actions from the room next door or from a car parked across the street. Conspiracy researchers are convinced that the transmission of ELF has been instrumental in the alleged suicides and mysterious deaths of scientists, UFO investigators, and witnesses to secret New World Order machinations. If the suicide brain frequency should be beamed at a victim, he or she would enter severe bouts of depression that would quite likely result in suicide. Researchers see this as an explanation why a scientist, a researcher, or a government official who was reported by his or her friends and family to have been positive and happy might suddenly become depressed and commit suicide after a few hours or days of ELF beams. Binary format used by System V Release 4 Unix. (Extremely Low Frequency) See frequency bands. Entertainment on Adare Street on Saturday was provided by an elf ukulele band, while children also got to take part in elf hula and elf graffiti, a make-and-take session where a graffiti artist helped budding elves to make their own individual canvases into Christmas presents and artwork. There was also an elf balloon tent where children were shown how to make their own elf balloon hats and other balloon models. They were also invited back at the end of the event at 3pm to take part in an elf flash mob recital of the elf song they learned in elf reception.